An incredibly important component of developing a spacecraft is to test how it works in space in order to discover any potential problems that would arise as a result of the hostile environment of space. For example, without air to conduct heat away, some components of ELFIN are more likely to overheat in space than when they are tested in the lab. As an answer to this problem, a Thermal Vacuum ("TVAC") is the best way to simulate a space-like environment here on the surface of the Earth. The first iteration ELFIN's TVAC was originally built in the project's infancy. It has since been continually developed and expanded in accordance with the various tests that need to be run in vacuum. TVAC as a whole is a complicated system with many different components that work together to achieve both the pressures and temperatures ELFIN would experience in orbit. The largest component is the chamber itself which is approximately four feet long and a foot and a half in diameter. 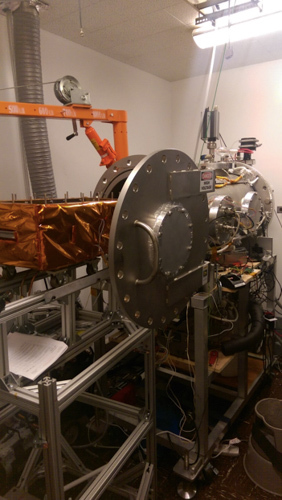 When tests are conducted, the spacecraft is secured inside a copper box which is then wheeled inside the chamber. Covered in Multi-Layered Insulation ("MLI") to block radiative heat exchange, the copper box acts as a thermal exchange plate which heats or cools the spacecraft according to whichever test is being run. The temperature of the copper box and the spacecraft itself is measured using thermally sensitive resistors called "thermistors" which are all connected to a computer that reads and records the data. Two different vacuum pumps are used in sequence to achieve our required pressures. The first is a mechanical pump which takes the chamber down to a pressure of around 150 millitorr (for reference, pressure at sea level is 760 torr). The second pump is a cryogenic vacuum pump which has a plate inside it that is cooled down to 11 Kelvin (-440°F). Once at 150 millitor, the chamber switches to the cryogenic pump which simply freezes all the remaining air to the cold plate, taking the pressure down to around 7 millionths of a torr. In a typical orbit, ELFIN's internals are expected to experience temperatures ranging from -20°C (-4°F) to 40°C (104°F). To achieve such temperatures gaseous nitrogen is run through the TVAC and the copper plate to either heat up or cool down the copper box. When cooling, the gaseous nitrogen line is run through a liquid nitrogen bath. When heating, the gaseous nitrogen is instead run through an electric cartridge heater. In either case, the spacecraft is brought to the desired temperatures and the intended tests are conducted. The first major TVAC campaign was done with the first engineering model of ELFIN ("EM1") in June 2017. Next, the radio antennae deployment tests were conducted throughout the summer of 2017 followed by Solar Panel Thermal Extreme tests in July 2017. The Thermal Subsystem the Super Simplified Thermal Balance ("SSTB") and Simplified Thermal Balance ("STB") tests were conducted in August 2017 in order to verify the accuracy of our thermal simulations. In September of 2017, we began testing ELFIN's main scientific instruments, the ion and electron energetic particle detectors ("EPD-I" and "EPD-E" respectively). During the 2017-18 winter break, the second engineering model ("EM2") campaign underwent a month-long stress test, experiencing temperatures above and below the extremes. After some general maintenance and improvements of the TVAC system the first trial cycles for the flight models was completed in April 2018. Finally, the full TVAC campaigns for both flight models of ELFIN ("FMA" and "FMB") were successfully completed in May 2018. Before delivery in July 2018, the TVAC chamber played an important role in the calibration of the flight EPDs.